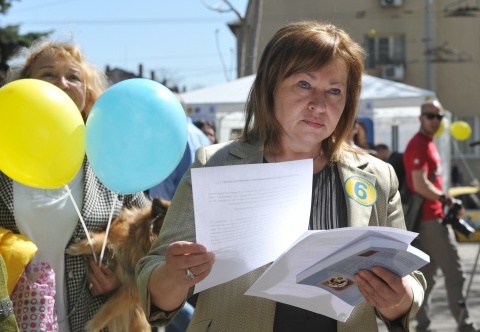 Hristina Hristova is chair of the liberal Bulgarian party National Movement for Stability and Prosperity (NMSP). Together with Korman Ismailov from Freedom and Dignity People's Party (FDPP), she co-chairs the Center - Freedom and Dignity coalition for Bulgaria's upcoming May 12 early general elections. Together with the Bulgarian Socialist Party and the liberal Movement for Rights and Freedoms, NMSP was a member of the tripartite coalition that ruled Bulgaria 2005-9. It did not enter Parliament at the last general elections in Bulgaria, July 2009, but has currently 2 MEPs. FDPP was founded in 2012 after a number of key members, including former vice-chair Kasim Dal, left the Movement for Rights and Freedoms. Ms. Hristova, the ongoing wiretapping scandal took a central place in Bulgaria weeks before the May 12 elections. Some say that this is an intentional smear campaign against former ruling GERB party. How do you interpret this phenomenon and how do you assess the reactions of implicated GERB leader and former PM Boyko Borisov and GERB campaign manager and ex Interior Minister Tsvetan Tsvetanov? Borisov and Tsvetanov did not show any political reactions, strictly speaking. They staged an artificial defense - Borisov more or less said "Tsvetanov swore in his children and I trust him" and that's it. You just can't have a situation in which the prosecution is saying that the former Interior Minister can be charged for improper wiretapping, and you see this same ex-minister clutching at his immunity of candidate-MP and pretend that nothing is happening. With such a scandal, in any normal country, even non-European ones, he would have been long ago out of election lists, out of his party, and out of politics. Now however GERB will reap the negative effects of the ill ambitions of its chair and their result at the election will be far lower than their current ratings. I don't believe that there is an intentional smear campaign against GERB. If that were so, then the campaign would have to be led by the prosecution. Can anyone suppose that? I can't. But people say: where there is smoke, there must also be a fire. Institutions must at least this time over discover the truth, then ought not cover things up agan. Yet, there is also something positive around this entire wiretapping scandal. We now have the chance to clean up the system and the state from the snooping approach and the abuse of power. A main emphasis in the election platform of the Center - Freedom and Dignity coalition is the growth of the Bulgarian economy. What specific policies would you implement? The growth of the economy in Bulgaria always has to do with investments - both foreign and domestic. That is why one of the certain ways to achieve growth is to again open the gates to investors. You will perhaps say that even now we have the lowest taxes and wages in the EU, but we still don't have investments. Yes, we don't have investments, because money loves safety and tranquility. But safety and tranquility come from a stable government which does not change its opinion 5 times a day, does not draft self-serving legislation, does not steal, a goverment which is not corrupt and is intolerant to contraband. In one word - a government that loves and gives way to fair competitiveness, makes the business climate sustainable and friendly for everyone, not only for those close to the cabinet. GERB did not act that way and chased away even the few who were willing and able to invest in Bulgaria. Yet there is one more condition - if the courts don't work, investors again run away. So the judiciary must also be seriously renewed. In short: we will not raise any taxes, we will not raise social security, we will make the state equal to businesses and citizens, we will make it pay its interests when it has arrears. Regarding the freedom of the courts - we would implement a full election of the Supreme Judicial Council by magistrates, with no party influence via quotas. Last but not least, we will take urgent measures so that cartels be placed under a strict control. The priority you put on Bulgarian education is also impressive. Do you think that state spending for education must be increased, or do you think education can be boosted in another way? Both NMSP and our partners from NPFD are firmly committed to education as a priority in government. For us this means a thoroughly thought out reform of all forms of education, including a careful and precise assessment of textbooks. And an even more careful policy for the return of the dignity of the teaching profession. Not the least - an ensuring of longterm good financing of the sector according to European norms, which are around 5-6% of GDP. At present, the meager 3.4% go for education in Bulgaria. We will not let the Finance Minister distribute budget funds before in the first place allotting the needed monies for education and then the health system. We are committed to that, because poverty in our country is due not only to the bad business climate, but also to the weak or inadequate education. Wherever there are educated and qualified people, there are also investments. This is the third means to attract investments and create jobs. Don't you think that some form of progressive taxation would contribute to restoring social justice in Bulgaria? Was the introduction of the flat tax by the next-to-last cabinet (for which NMSP had an important input), if we consider the drop of FDI in the last few years? Yes, NMSP was the reason for the introduction of th eflat tax and this was the most successful policy not only of the tripartite coalition, but also of GERB, which did not change it. Revenue drastically rose. Yet the crisis deepened so much and growth was so delayed, that although we at NMSP are staunch supporters of the flat tax, together with our partners at FDPP we decided that it is appropriate to introduced family-based taxation. We did that clearly realizing that we must conduct a policy in support of families and children. The compensation for the state budget will come from cutting down smuggling channels, in which BGN 2 B sink each year just from cigarette excise taxes. Bulgaria has no future without children and that is why we are ready for differentiated taxation for families. At the presentation of the coalition you said you attempted to achieve a broader union of center-right powers. Why, do you think, this did not happen? Given the big fragmentation, wouldn't have everyone benefitted from such a union? We are still convinced that a broad center-right government can lead the country out from the misery and crisis more painlessly than any other kind of rule. Everyone would have gained from such an election union. Trust me, for an entire year we in NMSP were working towards that, but at th end of the day only Kasim Dal's party saw the true powers of such a coalition. We are of course sorry that the Union of Democratic Forces and others did not join, but if they have decided to die out one by one, we cannot stop them. We at NMSP and FDPP are not sorry for our election coalition, which is based on shared values and goals. We now have good election forecasts, for just days ago two different polling agencies came out with data showing that the NMPS-FDPP coalition will enter in Bulgaria's next parliament. Korman Ismailov, who together with you co-chairs Center - Freedom and Dignity, was received on April 19 by the Turkish PM Recep Tayyip Erdogan. How do you assess Bulgaria's role in Turkey's new foreign policy? You should rather switch the question around. I think that Bulgaria's foreign policy cannot but be geared towards good neighborly relations and economic cooperation with such a gigantic neighboring country as Turkey. Good relations can only help our country. And we have traditionally had precisely such relations with Turkey. I am very happy that my young colleague Ismailov was received by a politician of Turkish PM Erdogan's rank. Is formation of the next Bulgarian cabinet going to be difficult, according to you? Everything depends on voters. We will see what configuration of parties will participate in the next parliament, and then we will be able to comment. As things appear to me at the present moment, the small parties will decide on the outcome regarding the next cabinet. And as a whole - surprises will come from the small parties, not from the large ones. By the way, it is precisely the small parties that can play a stabilizing role in Bulgaria from now on. Some opinion polls seem to suggest that it is possible for GERB to obtain again close to 50% of MP seats. What would a second GERB cabinet mean for Bulgaria? We highly doubt that a new one-party cabinet by GERB is possible. And if we have a coalition government, then things depend on who the coalition partners are. What is, in your mind, the message of the word "dignity"? Dignity is an intimate feeling for every person, it is a characteristic of the relation of society to the individual and vice versa. At present however human dignity in Bulgaria is lowered to such a degree that it is dependent on material things, on the impossibilty to maintain a quality of life. This is very sad and must change. People must be free and dignified, and to feel this way in their own country, so that they can be proud with it.